Saturday morning, I woke up to see that my windows in my house were already fogging over from the heat and humidity before 7 am. Not a great sign, but I got ready and headed out to the park anyway to get my 8 mile long run for the week. I was a little worried because of the weather and because this training plan is definitely pushing more mileage earlier on than I experienced last time. It’s been frustrating feeling so slow with the heat and the humidity, despite reminding myself over and over that it will get better when it is cooler and that this training plan that seems so daunting will pay off in October. I was not in the best mindset, to say the least, as I headed out. I parked at my gym and headed out through a swankier neighborhood than my own to start my run and after half a mile, I hooked into the trails at Lake Zorinsky. I ran most of my long training runs for the Princess Half Marathon at Lake Zorinsky and something about traveling those paths again this weekend made me feel more confident and at peace with my running than I have in the last couple of weeks. Yes, it was hot and between the sweat and humidity, my running skirt was soaked by mile 3 (and dripping on me with each step!). 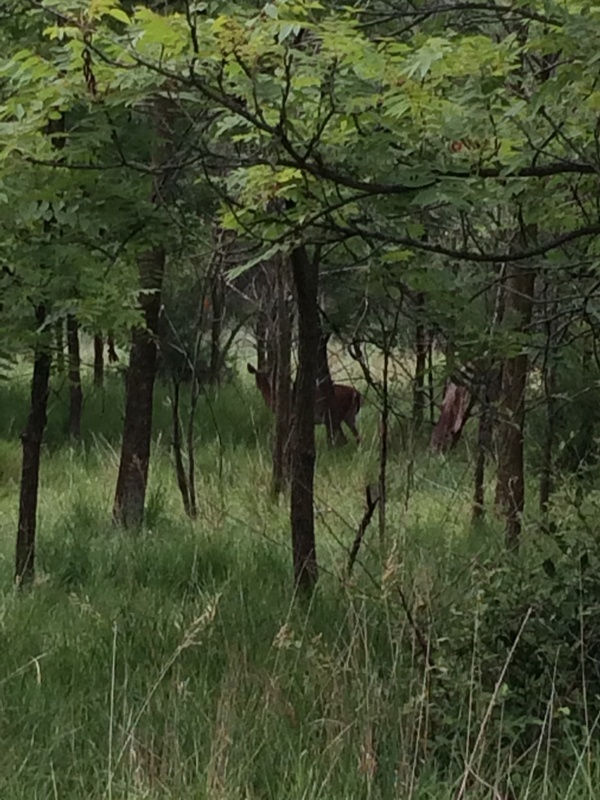 I love that there’s always a glimpse of wildlife through the trees when I run out here. Somehow that mattered a whole lot less as my feet retraced steps I’d taken over and over again through the last year, along the journey to run 13.1 miles for the first time. I saved this trail for my long runs, so every time I finished a run out here during Princess training, I was reaching a new personal best in terms of distance. Maybe that’s why I associate it with “success.” In retracing those steps, I was reminded that I’ve done this before. I’ve put in these miles before and been rewarded by crossing the finish line. 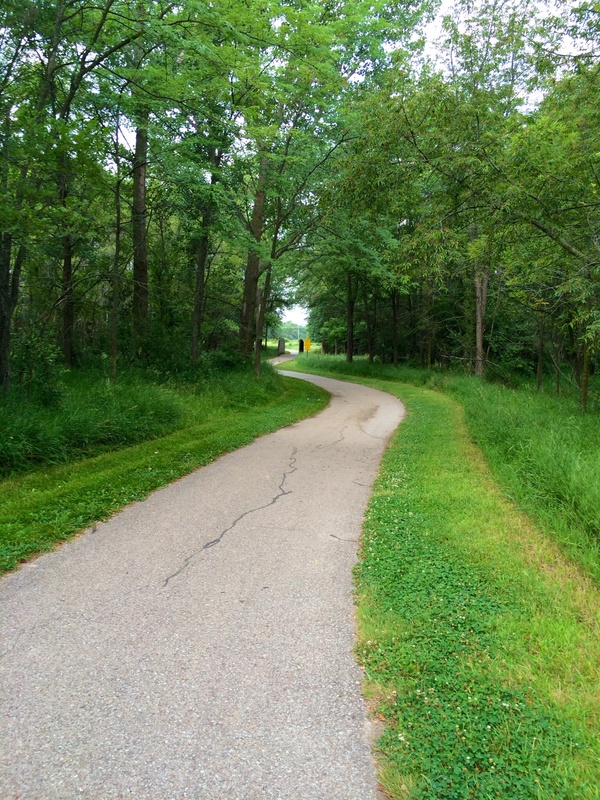 It helps that it really is a gorgeous path, especially in comparison to my normal runs through the suburbs. Do you draw motivation from the places you run? Where’s your favorite place to run? 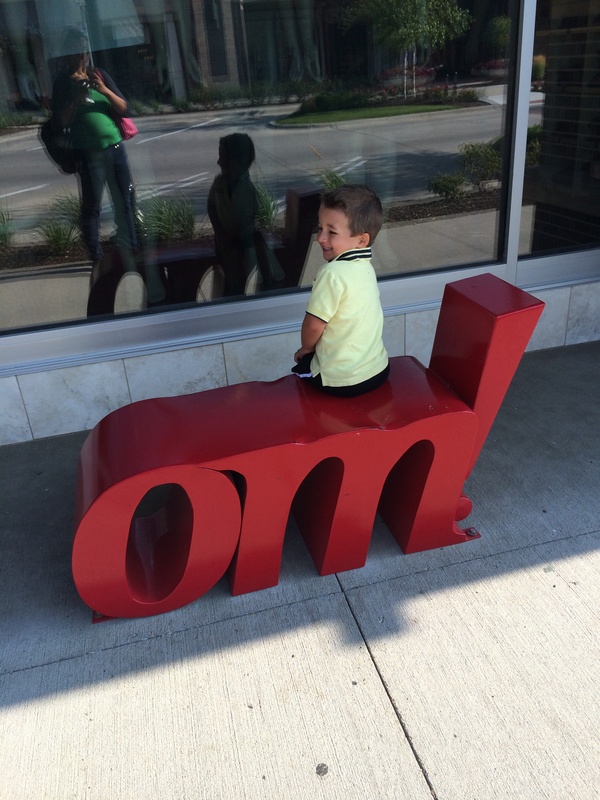 Thanks to all of you for your kind thoughts and support with my little O this week. Writing here Monday night really helped me to cope with all I was feeling in a more productive way than my usual coping mechanism of eating. I tend to write my blog posts at night as a way to sort through whatever is on my mind at the moment. I’ll confess it is not as cathartic as pen to paper journal writing can be, but it is a very close second. Thinking about the role the blog has served as a journal for me in the last year (coming up on one year in a few weeks!) sent me scurrying off to find my more traditional journals. I’ve never been particularly consistent with writing in a journal, but I do try to write when I’m going through big emotional decisions. Particularly for those of us who struggle with emotional and/or binge eating, it is crucial that we learn to recognize our emotional triggers and learn to handle them more productively. Writing (or vloging if you’re more verbal than written) can help in several different ways. – Taking the time to write anything at all distracts me enough that the urge to eat may pass on its own. – Beyond distraction, writing and re-reading my words helps me to identify what is really bothering me. Once I’ve identified the problem, I’m working on learning to rationally find solutions, which are not-so-shockingly, rarely actually food. – If you’re comfortable sharing what you’ve written, either on a message board or blog or with a therapist or spouse, it can help you find support in your struggles. For me, this is helpful because I can articulate things so much more clearly when I’m writing than in stumbling over my own thoughts when I try to speak about something that is bothering me. My emotions can easily get in the way of my tongue. You absolutely don’t have to share what you’ve written though! Just processing the words for yourself can have huge benefits. – If you keep what you’ve written, it can a helpful tool for looking back at patterns to find what you most common triggers are. Mine are definitely parenting issues these days. It can also be really motivating to look back at prior successes and to see how far you’ve come. I sometimes re-read blog posts about other times I’ve overcome the urge to binge to remind myself that I can do this because I’ve done it before. 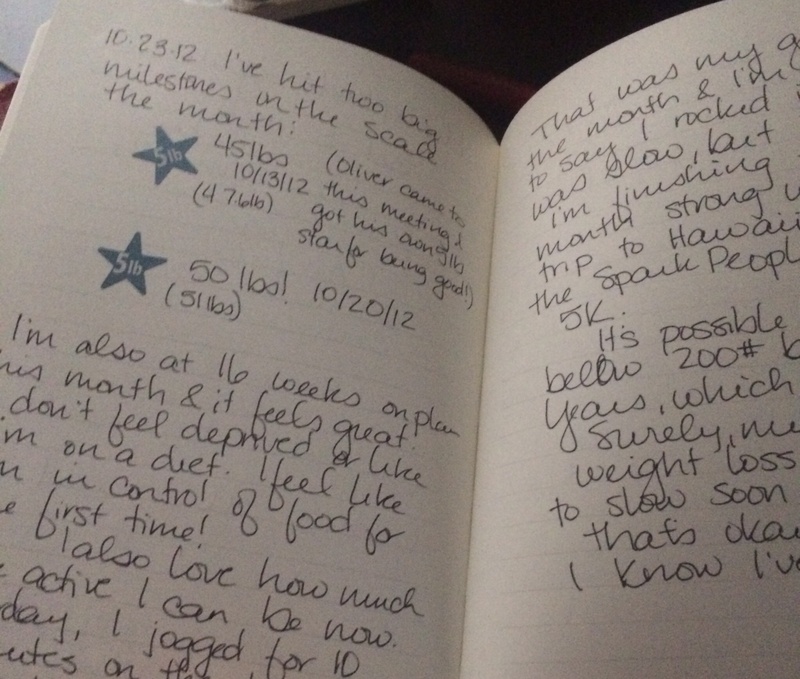 Similarly, looking back at my notes about the weight loss journey from my pre-blog days reminds me how far I’ve really come. Sometimes in the daily struggle of maintenance, I forget just exactly how huge the weight loss I’ve accomplished really is. – You don’t have to keep what you’ve written though! Sometimes it is especially cathartic to trash whatever you’ve written (I confess to some therapeutic crumpling, ripping and/or trashing when I was particularly upset with someone and venting on paper). – On a more positive note, it can also be very powerful to write down your goals and commit to them on paper even if you aren’t quite ready to commit to them publicly. Taking ownership of an idea is powerful even if you’re the only person who ever reads it – you know and that’s enough. This PDF includes a ton of worksheets about approaching weight loss that can serve as writing prompts to get you started. Leanne has also written about some great examples of using writing to process thoughts and feelings about food to help deal with emotional and binge eating (like this post and many others – check her out and the Beck Diet Solution Workbook that she references as well!). I got to daycare a little early yesterday to pick up O since I’d left work early for an oil change and they finished faster than I expected. When I arrived at school, they were on the playground and my guy was sitting off by himself (looking for bugs he tells me). When I got there, he stood up and another kid ran across the playground to shove him to the ground. O was crying, the other kid was laughing and the teacher ran off to corral the other kid while O ran to me. After some talking at the fence, the teacher brought the other kid over to O to say sorry but the other kid was still giggling and O, being a toddler, starting giggling too. The teacher made some offhand comment about rough housing and we left before I said something I shouldn’t because I was LIVID. This is the same kid that bit Oliver for a year and the same kid that O has been telling us stories about for the last few weeks, where he gets pushed by this kid or this kid tells the other kids not to play with him. They’re 3 year olds! I wasn’t ready for this kind of bullying yet and I’m worried that’s what this is. Rough housing implies something both parties are participating in and that wasn’t what happened here. With the things O was telling us, we were naively trusting that he must be misinterpreting things and his teachers would tell us if there was a problem. After what I saw today, I have lost a lot of faith in his teachers. Who could be mean this guy? I know what O needed for me to be calm and to be there for him and not add to the stress. He seemed okay once we got home and we worked in the yard, went for a walk and had a great dinner together. At bedtime, he wanted me to come in and sing and rub his belly because he didn’t feel good, which has become a more regular thing lately and I suspect I now know why. We will meet with the teachers. We will love our child and help him learn to respect others and keep his beautiful empathy and develop a healthy self esteem and I know he will get through this. I hope the other child also gets the help he needs because being a bully isn’t healthy either, physically or psychologically. I rationally know this but my mama bear is raging. And the part of me who got accused of being “too sensitive” because I didn’t like my family’s harsh teasing “humor” as a young adult worries that I’m overreacting. Sigh. I’m rationally pretty sure I’m not and there’s risk in under-reacting here so I think I’ll follow up with his teachers. Amidst all of this though, I didn’t want to eat. I wanted to go for a long run, where I could vent all of the inappropriate things I want to say and do about this situation. Remarkably, though, I didn’t want to dive into pizza or ice cream. I texted my husband and ranted a bit on Facebook. I messaged my parents because I knew their anger would both make me laugh and help me keep my own in perspective. I got O and I drinks at Sonic (because days like this call for the magic of a Sonic drink – what is it about their ice and sodas?) but didn’t feel tempted by the mozzarella sticks. I wrote here to vent a bit too, all healthier means of dealing with distress than a binge and all (knock on wood) with far less effort than it would have taken on stay on track a year ago. It’s not perfect – I admit I inhaled the grapes that my husband had washed for breakfast in the morning – but it is definitely progress and that is a definite victory. Social support for workouts: love the kudos! I’d never used Strava until the 13.FUN challenge because it seemed like it was designed for much more serious athletes than I am. It was originally designed by fairly intense cyclists to allow you to virtually train and compete with others, in that you can see how your performance on a certain route compares with that of other Strava members who’ve covered the same route. That honestly has no appeal for me as a member of the mid-back of the pack club. However, I am really enjoying the club chat board that comes along with the 13.FUN program! It’s been a great place to post questions and get support from others who are at the same phase of training as I am. While the “leader board” for the 13.FUN club page is dominated by people who get in more and faster miles than me, the message boards are dominated by other moms like me who are struggling to squeeze it in at slower paces and celebrating every little victory. Even when I don’t post or reply to comments myself, I love getting the little emails celebrating people’s victories or seeing someone with a question just like mine. I also love that Sarah, Dimity and the running coach who designed the training plan, Christine, all participate and answer questions there as well. 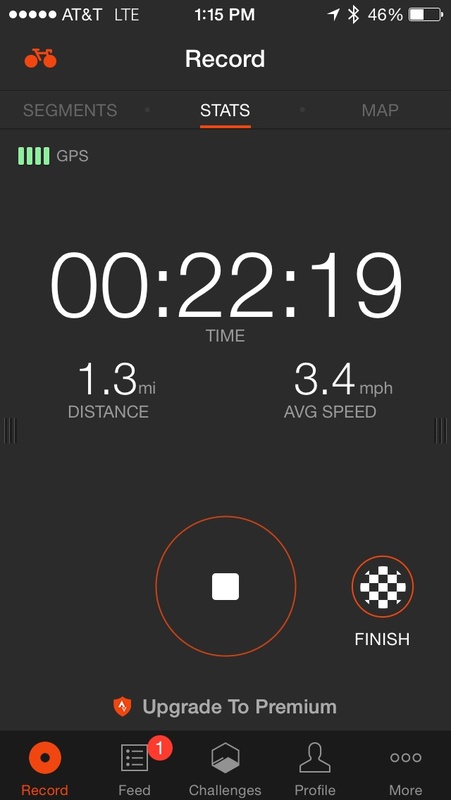 Strava has a built in GPS tracker. As far as the activity tracking portion of Strava, the GPS tracker on the phone has worked well when I’ve used it but I tend to use my Garmin and then update Strava via the Garmin rather than using my phone battery by running the GPS if I don’t otherwise need it. I do wish the app made it easier to manually enter the workouts you don’t use the app to measure and to interact with the message boards through the app. With your workouts loaded, you get “kudos” from friends who are following you and likewise, you can give kudos to those you’re following. It’s a nice little boost to get thumbs up after you log a workout! 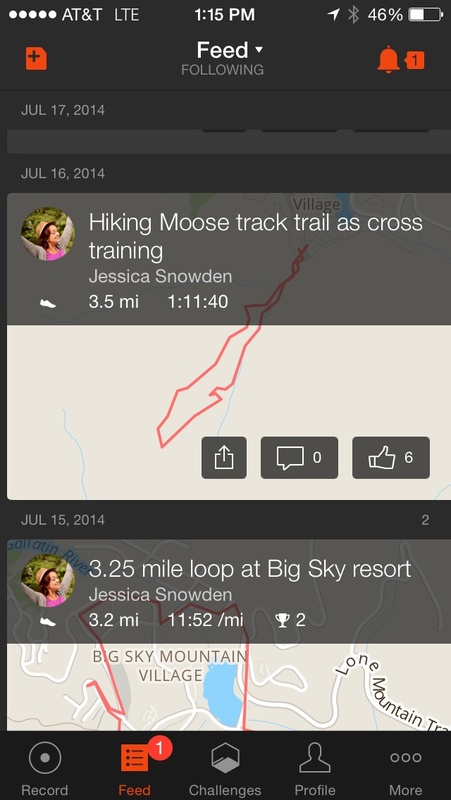 You can get virtual kudos from friends on your workouts once they’re loaded. 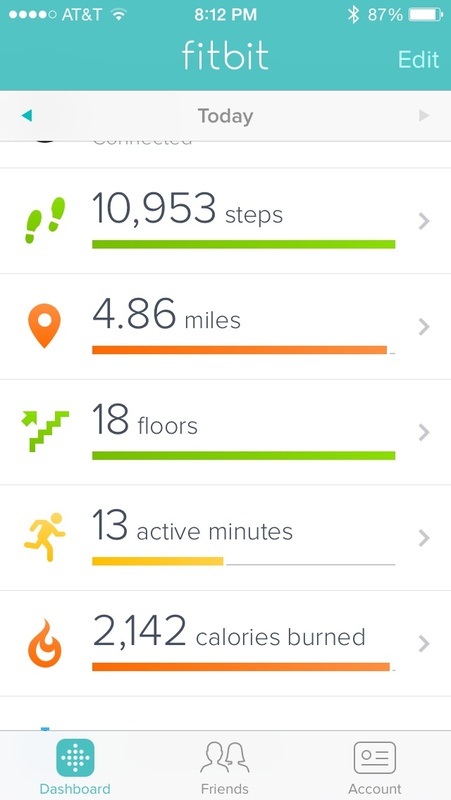 FitBit also allows you to share your steps each day via lots of social media options and the competitive part of my loves that my weekly report tells me how I’m doing in relation to my friends. 🙂 I only have two friends on FitBit, but it is definitely motivating when I’m not at the top of that leader board! Thanks to a walk to the grocery store for hubby’s Doritos I got to 10K steps even on a rest day! FitBit is also great about fun little email awards when you hit milestones like a new number of steps for the day or a flights of stairs. The former A student in me loves getting gold stars, even if it is from my tracker. Having the FitBit app helps me see where I am in terms of steps, flights of stairs, calories, etc as I go through the day without having to physically check the FitBit on my bra strap (which can get understandably awkward). I started using EveryMove about a year ago after an email from my insurance company. EveryMove syncs with a wide variety of fitness trackers (I synce with my FitBit) and allows you to manually enter a wide range of fitness activities. You get points for those activities and those points add up to get you a wide variety of rewards. When I first signed up, my insurance company was donating money to charity for the points you accumulated. Beyond the deal with my own insurance company, EveryMove allows you to use the points to earn discounts / coupons for various healthy companies, like yoga classes or healthy snacks, or charity donations. 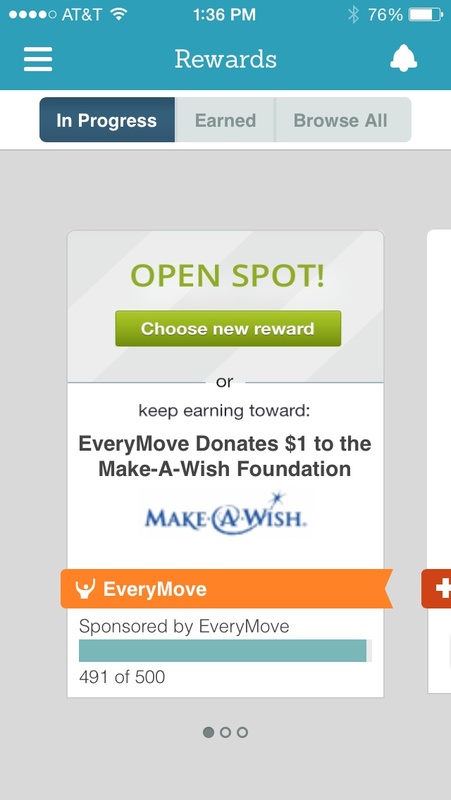 My go-to is the Make a Wish donation for my Every Move points. Love the bright happy graphics for active days! It also offers the opportunity to follow your friends and cheer them on with their various activities, including awarding them extra points. I clearly get way too much of a self esteem boost from my electronic kudos, I know, but on tough days it’s nice to get that little happy gram on my phone. 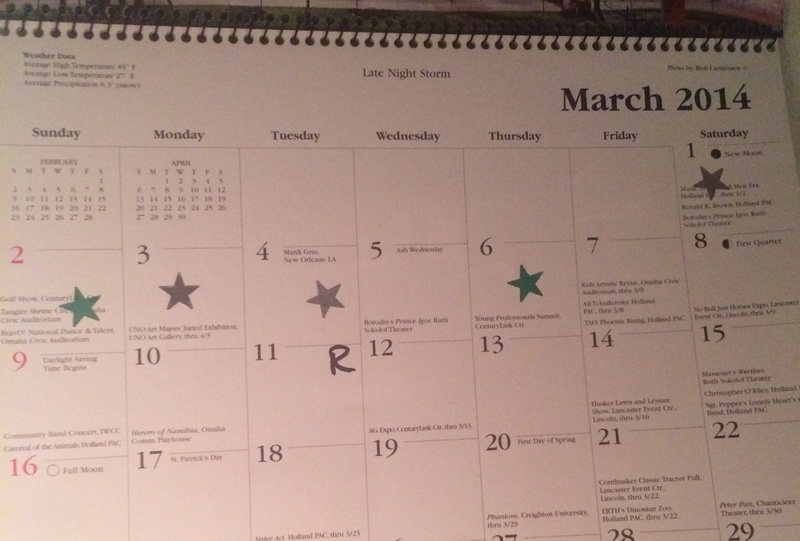 🙂 It’s a just a slightly more high tech version of my old school calendar with stars for my workouts that I used in days gone past. I got asked to review the updated EveryMove as a Sweat Pink Ambassador, but got the app on my own and all opinions are my own as always! I apparently missed a week of unseasonably cool weather here in Nebraska when I was up in Montana last week but summer is back with a vengeance here for sure. I keep reminding myself that when the race actually gets here in October it’s very unlikely that it will be 90+ heat with crazy high humidity. Whew. 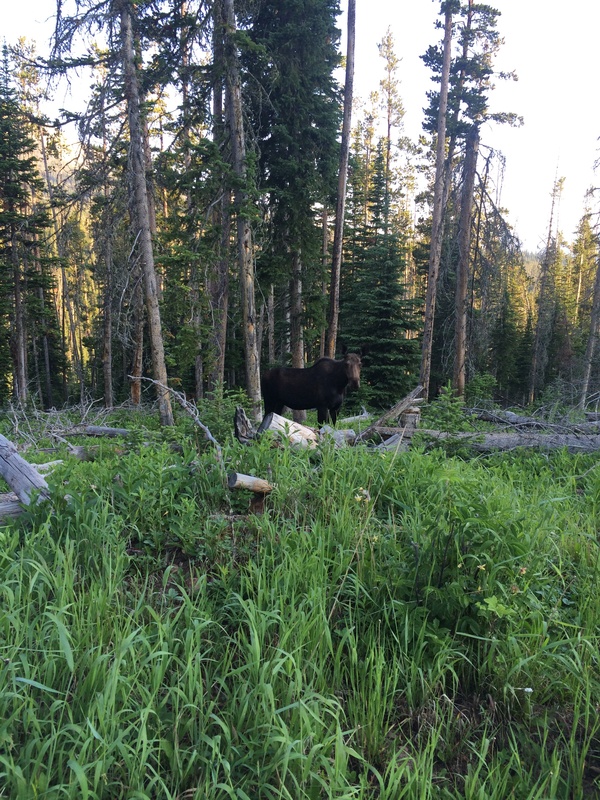 Did I show you guys the moose I came across on my hike the last morning in Montana? She just stared at me as I eased on by! Monday The schedule called for 3 miles with strides or cross training. I went the cross training route, with a nice hilly walk. This training plan has a lot more and more intense mileage than the last one, so I’m going with cross training whenever I can to hopefully increase the odds of coming through this injury free. Fingers crossed! Tuesday 6 miles – all done in the morning before work! This felt like a huge victory because I am seriously concerned about getting this long Tuesday morning runs in. They rotate throughout the training plan, 4, 5, 6, or 7 miles and that can be a ton to get done in a single chunk as a working mom. Anything more than 5 felt like a real stretch, so I was very proud of myself for getting up early enough to get this done. Of course, next week it’ll be 7 miles when seems massive! Thursday Hill workout on the treadmill – 10 minute warm up at 5-5.5 mph, then four 45 second hill intervals (5.5 mph, 6% incline) with a 1 minute recovery between and a 10 minute cool down. 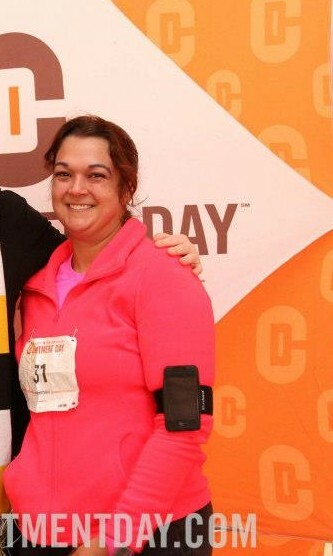 I covered 2.2 miles in that time, but holy cow was I drenched! It didn’t feel too bad during the hill intervals but when I was done my legs were toast! I really enjoy the challenge of these workouts. Friday 4 miles or cross training – I went the cross training route with a 2 mile walk to lunch with Darrell, which was hot but a nice break during the day (and brought my funky little sweater tying NSV I mentioned yesterday). Saturday 8 miles @1151 pace – it was crazy hot and humid, so that pace felt really good actually. It was a great run and I was amazed when it was over that while 8 miles was definitely work, it was completely doable. Thanks to the humidity, I was drenched by mile 3 and completely soaked my car seats. Ick! With summer training, I’m going to need to bring a towel or something to protect my car seats after these sweaty runs. This is only week three of this training plan (15 wks total) and I’m already at 8 mile long runs, which took much longer to arrive at with the Hal Higdon novice plan I did before (wk 8 of 12). I’m proud of myself for being ready for this and looking forward to how this pays off in October! Saturday night was date night with O, which meant rewatching Frozen, naturally. 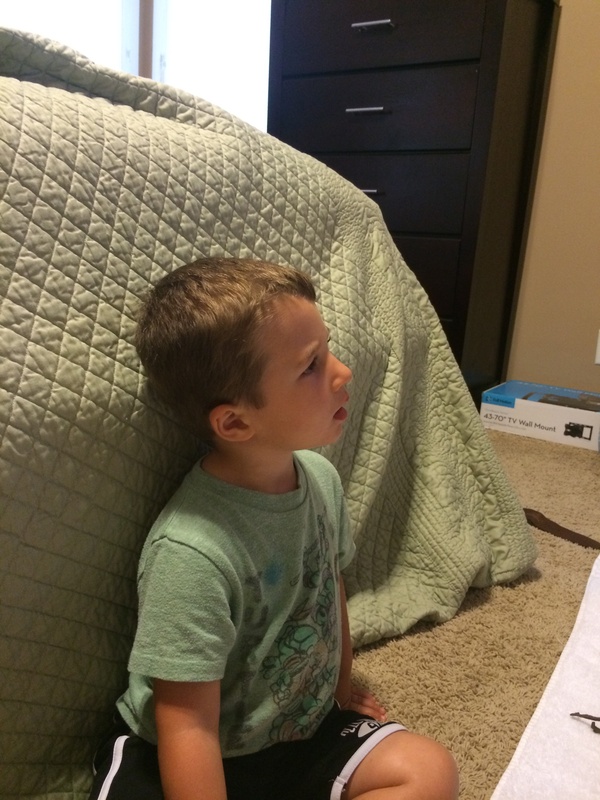 I took this pic right after he shushed me because “Elsa gonna sing now Mama” and then sat rapt watching her Let It Go. 🙂 That song will forever remind of the back half of the Princess Half Marathon! Sunday Rest day, plus my second strength training workout of the week. I’m definitely noticing a difference in my push ups and planks! I hope your workout week has gone well! Enjoy your Sunday! Yesterday, I had a handful of non-scale victories, which were a much appreciated boost in the midst of a summer full of slow, sweaty runs and stagnant numbers on the scale. What are your NSVs for the week? Shout ’em out! 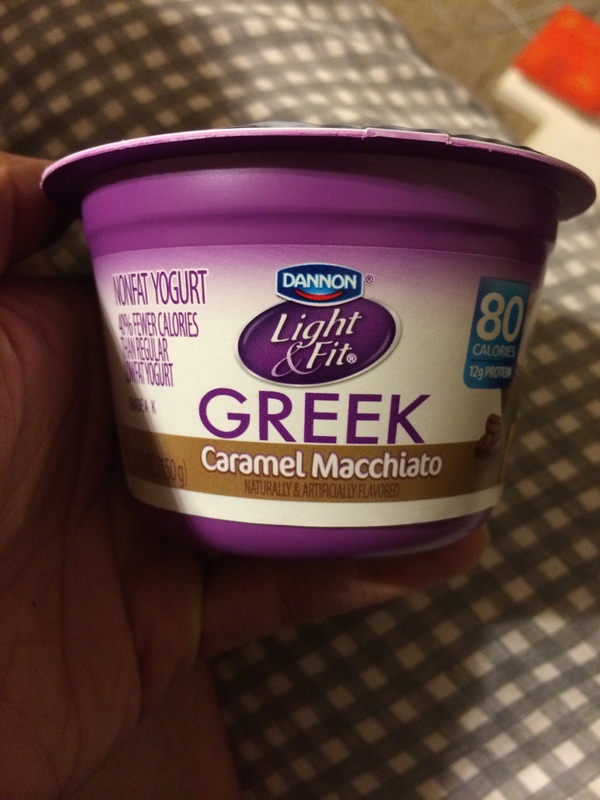 This caramel macchiato greek yogurt has officially replaced my usual PB2 and greek yogurt for a night time snack. Yum! As I mentioned earlier this week, I’m a big reader and many date nights end up with my husband and I at a bookstore. We tend to alternate between one of our local independent bookstores, The Bookworm, and Barnes and Noble depending on the hour and the type of book we’re interested in. We absolutely love that we have a big, bustling independent bookstore in Omaha and try to support it whenever we can because it definitely a dying breed. The staff in The Bookworm are so passionate and knowledgeable about books that it is definitely our go-to if we’re looking for a new kid’s book (the children’s section is fantastic!) or a gift for someone. As local bookstore lovers, we were excited to see this program sponsored by author James Patterson (of the Alex Cross series). He is bankrolling a literary fund, with $1 million of his own money going to support independent bookstores around the country. You can nominate your local store here. At the last Weight Watchers meeting I attended, the same woman who asked about getting started running while overweight also wanted to talk about her frustrations with having so much weight to lose. I know more than most how giant a task that feel like and we talked a lot about trying to give herself credit for the good things she was doing rather than beat herself up for how far there was to go! I really wish I’d had this to share with her then: 9 self care tips I learned from losing 120 pounds. We need to be kind to ourselves along this journey. There are enough times where I felt like everyone else was judging me harshly – there’s no reason I needed to pile onto that negativity. In that vein, also check out this fantastic post from UnderwearinOurKitchen about fat shaming. I found myself cheering along with this lovely lady the whole way through! We can be healthy at a wide variety of sizes and need to work on accepting that (both me as an individual and us as a society). I hope you guys all have a great weekend! I’m looking forward to a date night with Oliver Saturday night and a nice long run tomorrow morning, with no other pressing agenda items. Here’s hoping for a restful, joyful weekend for us all! At my last Weight Watchers meeting, I got stopped by a woman on the way out to ask for tips getting started as a runner. I’d mentioned during the meeting that I started running when I was early in my weight loss journey and still at 250-ish pounds (more about how I got started here). She had a lot of questions about running as a chubbier lady and I tried to answer as many of them as I could. I thought I’d also talk about some of them here (with the caveat that I’m not a physical therapist, trainer or sports medicine professional of any kind – this is my experience only! Check with your doctor!). I started running in August 2012 and as you can see in the pic above, I definitely didn’t have a typical runner’s body at that point. I still don’t really, but that’s beside the point. 🙂 I’ve talked before about how to get started from a running and fitness perspective (here) but there are some body specific issues that I’m going to get a little honest about here. – Chafing: A real issue when you have a lot more loose skin and places to rub. While reading about running may lead you to think that only long distance runners need to worry about Body Glide, the truth is we chubby chicks know that rubbing happens when you walk a lot, much less running. I definitely chafed in lots of places with even relatively short runs when I was heavier. You don’t have to go with just BodyGlide, which feels a little “athlete” specific and was intimidating to me to start with. Check your local Target or WalMart – Monistat makes an antichafe cream that hangs out with the other yeast infection medications. It doesn’t contain any medication for yeast. I think it just lives there because Monistat makes it. 🙂 Anyway, it works well for chafing. Deodorant also works in a pinch. – Wear fitted clothes: I know, I know it is the last thing I ever wanted to do – expose my rolls. However, not only does something more fitted and wicking help with the chafing problem above, it also helps hold in some of the jiggling. Compression was always helpful for the bouncing of my belly in particular. I got most of my plus sized workout gear from Old Navy. Their compression gear works well, goes up to plus sizes online, and goes on sale fairly regularly. Target also has a reasonable selection in their C9 line. I’ve got a couple of links down below for more resources. The other thing I noticed when I wore loose cotton clothes – it just made me feel heavier because they added bulk and lots of sweaty weight. I tend to gravitate toward fitted bottoms that come up over my belly a bit and looser tech shirts on top. – Sports bra: A good sports bra is a must if you weight comes along with other generous endowments. I cringe remembering how long it took me to get a good sports bra. My chest got seriously sore from the bouncing in my 5+ years old clearance sports bra I used forever. The Old Navy bras are decent, the Champion bras at Target better and the Moving Comfort bras expensive, difficult to get in/out of but absolutely the best for support of my DDs (well, DD then – a casualty of weight loss). More tips on finding plus size sports bras below. If you’re only spend money on two things as a plus size runner, buy one good bra . . .
– And good shoes! Don’t be afraid of the running store! Going to the running store at 200+ pounds to get fitted for good shoes was terrifying and yet so important, particularly because I was heavy. Added weight is a risk factor for many running related injuries, particularly plantar fasciitis, which I’d already struggled with. Getting good support for your feet is essential and be aware that as a heavier runner, you may wear your shoes out faster. – Don’t be afraid to check out men’s sizes for things like arms bands for your phone or belts: They tend to be a little larger and more forgiving than the women’s sizes. – Find a way to drown out the inner voice: I know I am not the only person who hit the road and felt like everyone was staring at me, galumphing along with fat rolls bobbing, red faced and wheezing. When you have thoughts, know that you are not the only one who has felt that, I promise you; I also promise you that most people are not noticing you at all and if they are, they aren’t thinking the negative thoughts you think they are. I also know that’s easier said than done. For this reason, I had to listen to music or an audiobook or something to drown out those thoughts and the sound of my own labored breathing. I’m amazed at people who run without music and listen to their own thoughts when they run. Their inner dialogue must be much kinder than mine is. That has gotten better over time, but I wasted a lot of time worrying about what I looked like running when I started. The important thing is that you are moving, not what anyone else thinks when they see you running. 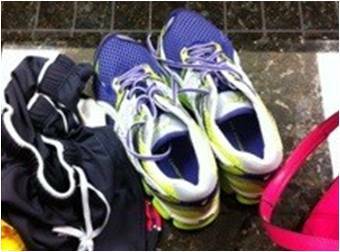 What advice would you give a newbie fluffy runner? 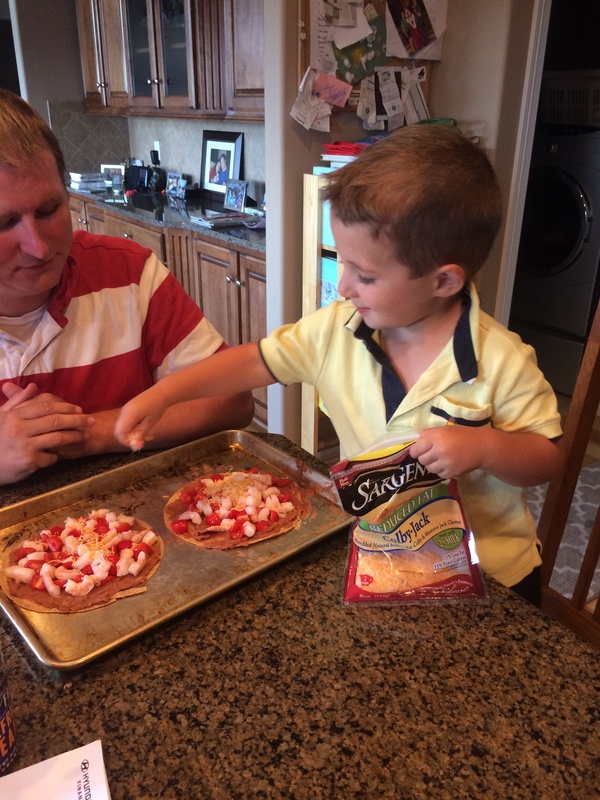 Weight Loss Wednesday: Getting the whole family involved in healthy eating! One of my biggest reasons for losing weight was to stay healthy for my guys and to serve as a better role model for my family. 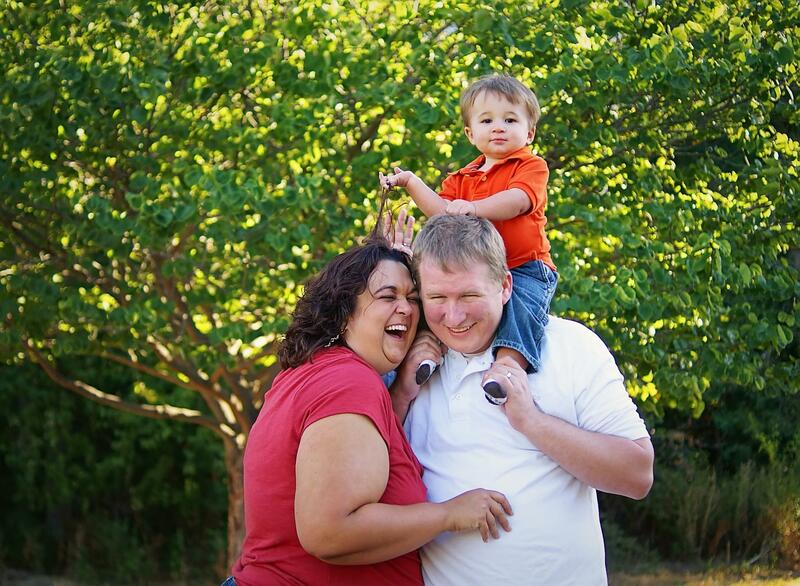 Ideally, the changes I’m making for my own health will trickle through to healthier eating for the whole family. That was a big motivation for the recent shift in my eating plan, so that we could all make better choices together. So far it is going really well, so I thought I’d go through some of the things that have helped us out. – Get everyone involved in choosing the food you’re going to eat. If everyone in the family gets a vote in the meals for the week, we’re all more likely to eat without complaining, right? I don’t want my husband to feel like he’s on a diet he didn’t sign for, so I definitely want him to get a vote in what we eat. All 3 of us, including my toddler, go through our cookbooks and magazines to pick out the food we’re going to eat for the week. We have some great cookbooks that help make this easier and fun for all of us. Oliver’s favorites are our Sesame Street cookbooks, which mark the steps that would be appropriate for him to help with. 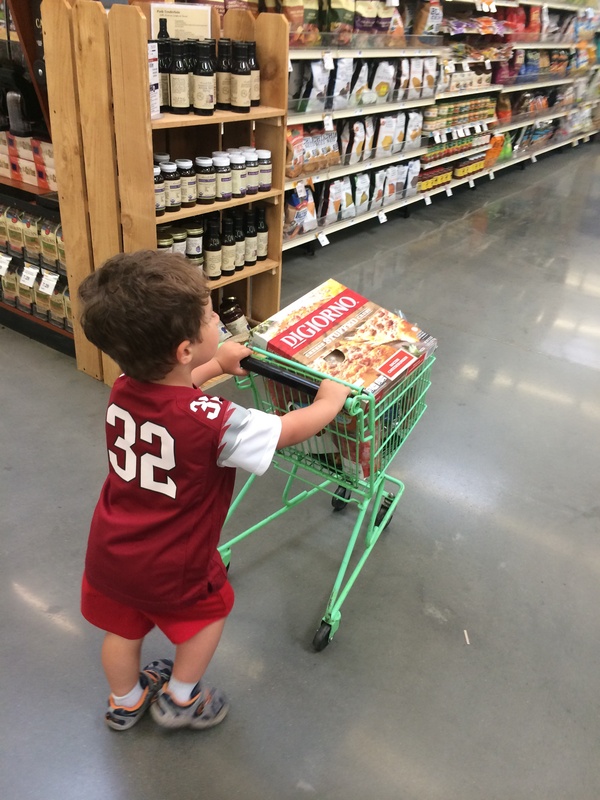 We also get O involved in choosing fruit and veggies at the grocery store, so he gets excited about food from the beginning. – Get everyone involved in cooking the food you’re going to eat. This probably helps get my kiddo on board more than my husband. O really loves to help out and he always does a better job eating the things he cooked, especially if it is something new or outside of his comfort zone. – Summer is the perfect time to try out fruit for dessert. Sweet juicy berries and peaches are better than most cookies or candies. I confess I was super proud of my little guy last, who chose peaches when offered peaches, apples or cookies after dinner. Establishing that habit of healthier treats now will pay off in the winter, when we have to rely on frozen or canned fruit, but at least we’ll have set a pattern. – Offer options for everyone to modify healthier meals to their own tastes. We like pizza and taco nights for this, because everyone gets to choose their own toppings and have control over their own dish. I’ve also done frittatas with a mix-in bar, which worked well. How do get your whole family involved in healthier food choices? All of that to say, finishing a book feels like quite an accomplishment these days. This week, I finished a running book I’ve had checked out from my local library for the last 6 weeks. The book is called Personal Record: A Love Affair with Running, by Rachael Toor. Rachael Toor is a writer for Runner’s World and Running Times who came to running in her 30s. This book chronicles her journey with running so far, from getting started to really training to progresssively longer distances. It is set up as a series of 26 (point 2, of course) short little essays and I confess, at the beginning I found it a little hard to get into. Part of that is the structure, with little snippets rather than a long narrative, and the lack of humor (or at least my kind of humor). I’m not proud to admit that part of it was also envy of someone who came to running late in life and yet was naturally more gifted and overall more successful thanks to training that optimized those natural gifts. Like I said, not proud of that. There really isn’t anything practical in terms of tips or advice for the average middle to back of the pack runner, I did enjoy the book more as I went along. A) I learned to really enjoy the essay structure as I went along. With only a few minutes to read at any given point, these little essays were easy to dip into. B) While there wasn’t much laugh out loud humor, Ms Toor really is an excellent writer who has the ability to carry you with her into these experiences. As someone who has never really tried much trail running, her stories about running on the trail brought into that environment and gave me a glimpse of what is so appealing about it. C) While there isn’t a single narrative as in a traditional novel, there is a definite arc of story development and in Ms. Toor’s case, that brings a real joy and gratification from pacing rather than racing. I definitely felt guilty about my earlier envy when I came to realize how much she genuinely did enjoy helping others achieve their running goals. 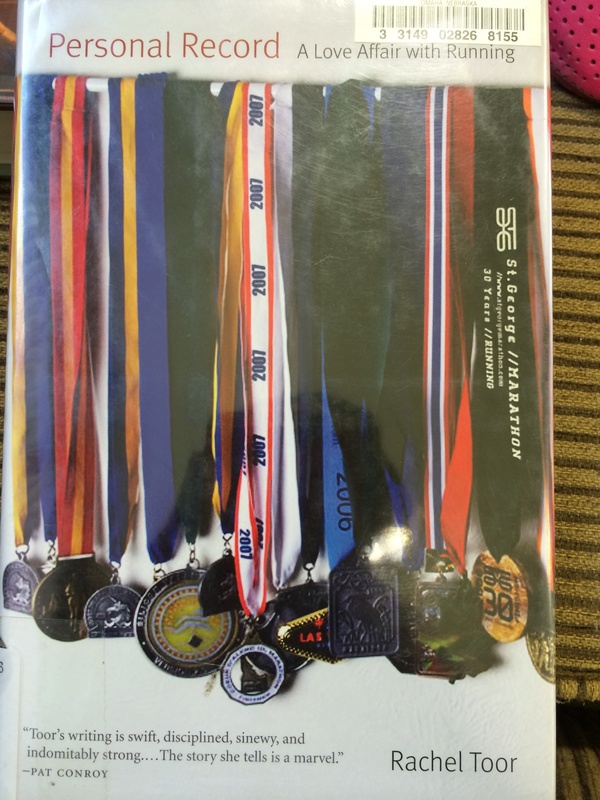 All in all, this is a good gift book for the runners in your life. The author’s genuine love for running comes through on every page and for me, at least, that overcame more initial doubts in terms of the structure and my many dissimilarities with the author. 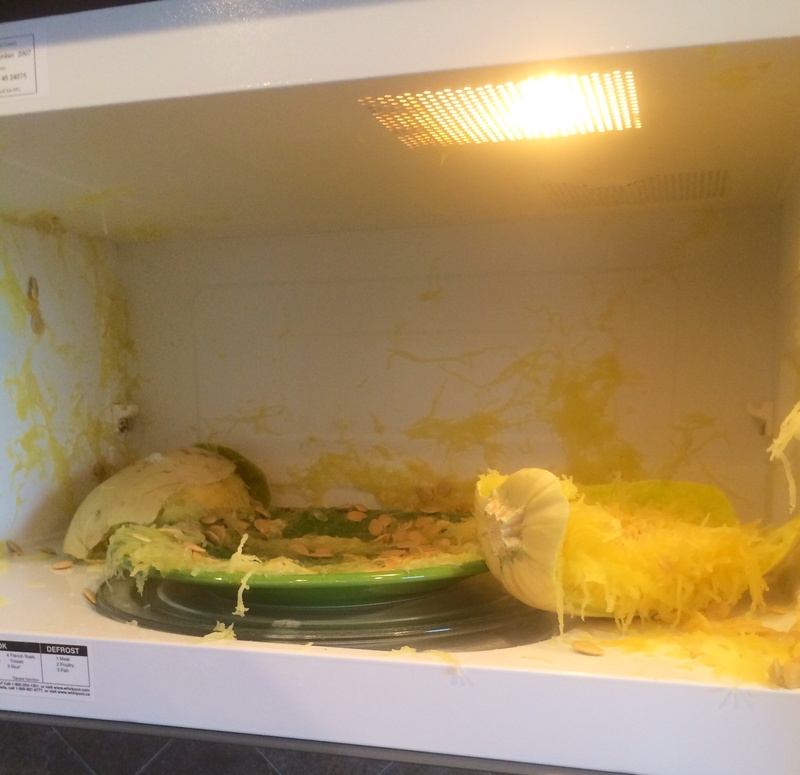 1) This is what it looks like if you make a spaghetti squash explode in your microwave. It made such a boom it knocked the door open. Love my hubby for cleaning up this mess after we were done laughing! 2) Today’s Tuesday on the Run link up topic is running on vacation. Check out my post on running on the road here and overall healthy tips while traveling here and here. I travel a lot for my job, so check out any travel related posts here. Thanks as always to Patty, Erika and April for hosting!